BUDAPEST, Jun 15 2013 (IPS) - Record floods in Central and Eastern Europe have highlighted some of the challenges of climate change for the continent, as well as the floods’ potential to spur populist politics. An extraordinarily long winter followed by weeks of intense rains has saturated soils and caused large rivers, such as the Danube and the Elbe, to overflow. The floods have wreaked havoc in the region, killing 21 people and forcing the evacuation of several tens of thousands. In Halle, Germany, 30,000 people were forced to leave their homes, after the Elbe reached its highest levels in 400 years. In Austria, mudslides brought about the closure of roads and train lines. The Polish capital of Warsaw was partially flooded, and in the Czech Republic, 20,000 people were evacuated from 700 different localities. Most of the flood victims – 10 out of 21 – are Czech, having been hit by heavy rains that at one point brought down hail stones of the size of ping-pong balls. Czechs feared for the fate of their medieval capital Prague, as authorities mobilised heavy machinery to sustain one of the city’s oldest symbols, the Charles Bridge, dating from the 14th century. Hospitals and even the city’s zoo were evacuated. The Czech government has estimated the damage at 800 million Euros, promising to waive the income tax for companies affected by the catastrophe. None of this drama was apparent in the Hungarian capital Budapest, where the Danube rose to 8.9 metres, the highest water level ever recorded. In contrast to the chaos and fear seen elsewhere in the region, the floods became a hotspot for what authorities call “catastrophe tourism”, in reference to the masses of locals and foreign visitors who gather around the riverside, taking pictures and often obstructing authorities’ efforts to contain the flood. In a city whose bridges are usually a prime location for suicide attempts, many were surprised to see a few daring tourists using them to dive into the flooded river. Citizens appeared equally unconcerned; youths drove skim boards into the water while the wealthiest water skied. The calm and surreal atmosphere in Budapest nevertheless reflected a situation firmly under control, in the capital as well as in the countryside. The differences in responses to the floods have highlighted the need for comprehensive and preventive strategies in a region where extreme weather phenomena are likely to increase as a result of climate change. 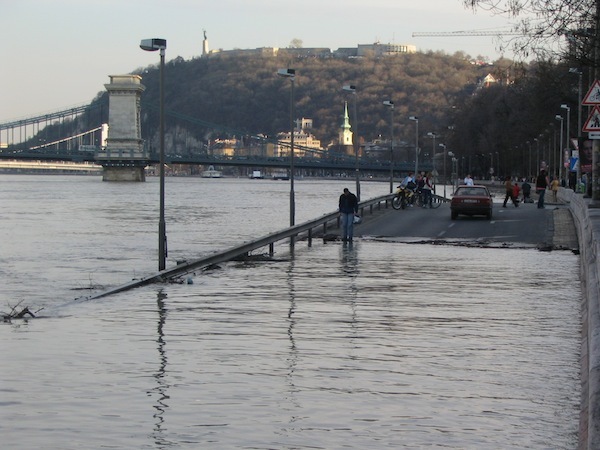 “Floods such as these put to test the ability of affected societies to adapt,” Sergio Tirado, a researcher at the Centre for Climate Change and Sustainable Energy Policy in Budapest, told IPS. “The impact of climate change will be more or less severe depending on the region’s response, namely in terms of developing early warning systems or improving physical protection barriers against water rises,” he said. The smooth handling of the floods by Hungarian authorities has been hailed as a victory by its prime minister, Viktor Orbán, which in the last few years has become the European Union’s (EU) most controversial politician due to his authoritarian tendencies. Orbán has been criticised by European officials for his heavy-handed approach to governance. He has been accused of challenging the independence of the judiciary, conducting widespread purges in the public administration and endangering freedom of expression. As a result, the conservative prime minister, under attack at home and abroad, saw the floods as an opportunity to stoke citizens’ patriotic feelings and regain lost popularity. Orbán capitalised on the efforts of the 10,000 soldiers, volunteers and even prisoners that were involved in placing some 10 million sandbags along the 700 kilometres of Danube riverside located in Hungarian territory. During the floods, TV and online coverage constantly showed the prime minister in action: Orbán was always at the site of events, wearing rubber boots and a vest, walking against the river current, flying in helicopters, discussing hydrographic maps with experts and cracking jokes with workers. Looking extremely tired, the prime minister made frequent live updates on the spot to keep citizens informed on what he called “the worst floods ever”. Opposition politicians, alarmed by Orban’s successful show off of his leadership abilities, rushed to imitate the prime minister and were seen setting up dikes along flooded areas. Pro-government media were quick to show one of these dikes breaking. While Hungarians were relieved that only 1,500 people required evacuation and that not a single victim was reported, many of Orban’s opponents will be concerned that his stunts against the forces of nature will convince many that he is strong enough to endure another onslaught of criticism from the European Union.